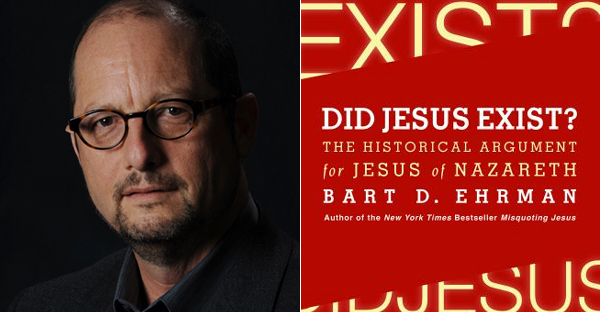 Two weeks ago I wrote about a problematic statement agnostic Bart Ehrman made in his recent book Did Jesus Exist?. While I appreciate the main thrust of Ehrman’s work, which argues for the historical existence of Jesus, there are nevertheless logical problems such as the one we shall examine below. Here I want to focus specifically on his misrepresentation of the fundamentalists/conservative Christians’ position on inspiration and the Bible, and how Ehrman ends up contradicting himself when he criticizes the fundamentalists/conservative position on the Bible’s historicity/factuality. Here the two camps refer to the same polarizing groups of Christian fundamentalists and secularized skeptics mentioned on page 72. Ehrman is going against the fundamentalists because he thinks the fundamentalists’ view of inspiration means the Bible is taken as nonhistorical. Readers who are fundamentalists/conservatives or even familiar with the works of fundamentalists will no doubt find Ehrman’s claims rather strange. Point 1: Ehrman should have footnoted and cited some example of fundamentalists who ” treat the Gospels as nonhistorical,” “because the Gospels are inspired.” As a Reformed Conservative Evangelical, I am not familiar with any fundamentalists who holds to Ehrman’s claim that the Bible’s inspiration means it is nonhistorical. Point 1a: The demand here in point 1 that Ehrman should provide some kind of citation for his claim is reasonable. The burden of proof is on him to demonstrate a claim which he even acknowledge is counter-intuitive: “As odd as it might seem, the nonbelievers who argue this are making common cause with the fundamentalists who also argue it” (Page 72; emphasis not in the original). Point 1b: Again, the demand that Ehrman should have provided a reference to support his description of fundamentalists’ view of inspiration is reasonable. Throughout the book Bart Ehrman does a really good job documenting and footnoting the position of the Jesus mythicists he is refuting, even when he considers them “nonscholars.” On page 132 Ehrman himself acknowledges that the fundamentalists camps does have capable scholars. If he is able and willing to footnote and cite the nonscholars he opposes, how much more so then, should he be able to document and give references to fundamentalist scholars and their view of inspiration that he is rejecting. Point 2: A survey of fundamentalists’ literature would reveal that their doctrine of inspiration presupposes the Bible to be historical rather than nonhistorical in it’s truth claims. A good case in point can be demonstrated by citing The Chicago Statement on Biblical Inerrancy, a key document expounding a conservative bibliology. Point 2a: “Being wholly and verbally God-given, Scripture is without error or fault in all its teaching, no less in what it states about God’s acts in creation, about the events of world history, and about its own literary origins under God, than in its witness to God’s saving grace in individual lives.” (The Chicago Statement on Biblical Inerrancy, Summary Statement 4; emphasis is not in the original). Point 2b: “We deny that Biblical infallibility and inerrancy are limited to spiritual, religious, or redemptive themes, exclusive of assertions in the fields of history and science. We further deny that scientific hypotheses about earth history may properly be used to overturn the teaching of Scripture on creation and the flood.” (The Chicago Statement on Biblical Inerrancy, Article XII). Point 2c: “When Adam fell, the Creator did not abandon mankind to final judgement, but promised salvation and began to reveal Himself as Redeemer in a sequence of historical events centering on Abraham’s family and culminating in the life, death, resurrection, present heavenly ministry and promised return of Jesus Christ.” (The Chicago Statement on Biblical Inerrancy, Explanation A; emphasis is not in the original). Point 2d: “No hermeneutic, therefore, of which the historical Christ is not the focal point is acceptable.” (The Chicago Statement on Biblical Inerrancy, Explanation B; emphasis is not in the original). Point 2e: The Chicago Statement on Biblical Inerrancy is concern with history, since the word history appears a total of 12 times throughout the document. Point 3: Oddly enough elsewhere throughout the book Ehrman’s criticism of fundamentalists’ view of the Bible contradicts his claims that fundamentalists does not take the Bible to be historical. In fact, whether explicitly or implicitly presupposed, Ehrman’s other criticisms of fundamentalists is that they take the Bible in it’s entirety to be historical rather than nonhistorical. It’s as if Ehrman’s criticism of fundamentalists’ view of the Bible is Schizophrenic. Point 3a: After Ehrman claim that fundamentalists ” treat the Gospels as nonhistorical” on page 72, he then contradicts this understanding of what fundamentalist believes about the Bible just two pages later when he wrote: “Once it is conceded that the Gospels can and should be treated as historical sources, no different from other historical sources infused with their authors’ biases, it starts to become clear why historians have almost universally agreed that whatever else one might say about him, Jesus of Nazareth lived in first-century Palestine and was crucified by the prefect of Judea. It is not because ‘the Gospels say so’ and that it therefore must be true (the view, of course, of fundamentalist Christians)” (Page 74; emphasis not in original). Point 3b: If fundamentalism did not subscribe to the historicity of the Bible which includes the Gospels, how could he have said the following: “But in a historical and worldwide perspective, highly conservative Protestant Christianity, whether fundamentalism or hard-core evangelicalism, is a minority voice. It is the voice that says that the Bible is the inerrant Word of God, with no contradictions, discrepancies or mistakes of any kind. I simply don’t think this is true” (Bart Ehrman, Did Jesus Exists?, 36; emphasis not in original)? Point 3c: As mentioned in Point 1b, Ehrman acknowledges that scholars who are fundamentalists exists in the area of historical Jesus studies and Pauline studies. In the chapter arguing that Paul’s epistles contain historical content concerning the historicity of Jesus, Ehrman notes the scholarly consensus about the contribution of the Apostle Paul’s writing to the study of the historicity of Jesus: “I personally know scores of scholars who have spent twenty, thirty, forty, or more years of their lives working to understand Paul. Some of these are fundamentalists, some are theologically moderate Christians, some are extremely liberal Christians, and some are agnostics and atheists. Not one of them, to my knowledge, thinks that Paul did not believe there was a historical Jesus” (Bart Ehrman, Did Jesus Exists?, 132; emphasis not in original). Yet if Ehrman is correct that the fundamentalists’ doctrine of inspiration means that Scripture (including the Pauline epistles) are nonhistorical in character, how can they participate in the consensus with other scholars that the Apostle Paul believe in the historical Jesus? Point 3d: There are more examples one can cite in Ehrman’s book and the corpus of his work of his criticism that fundamentalists believes in the literal and total historicity of the Bible. Ehrman’s criticism that the fundamentalists’ doctrine of inspiration makes them view the Gospels as nonhistorical suffer from the problem of (1) not being proven by Ehrman, being asserted despite the absent of evidence, (2) is contrary to the evidence found in fundamentalists’ literature and (3) contradicts Ehrman’s own criticism of fundamentalists’ view of inspiration for assuming the Bible to be thoroughly true and historical. In essence, his misrepresentation of the fundamentalists’ view of inspiration and historicity of the Bible is unfounded and irrational. Thanks for a very detailed refutation of his twisted view. Lord bless. Good refutation concerning his contradictions. Another quote from the book where Ehrman describe Fundamentalist’s biblioligy that contradict with other quotes of his, in speaking about Jesus being interpreted as God Ehrman writes, “This view is rooted in the fundamentalist doctrine of the inerrancy of scripture, where everything Jesus is said to have said, for example in the Gospel of John, is historically accurate and beyond question” (page 232).